With four young daughters and a miserably failed marriage, Debra Gwartney moves halfway across the country, to Eugene, Oregon, for a new job and what she hopes will be a new life for herself and her daughters. The two oldest, Amanda, 14, and Stephanie, 13, have a symbiotic relationship so intense they barely know where one begins and the other leaves off. They come to blame their mother for their family's dislocation, and one day the two run off together-to the streets of their own city, then San Francisco, then utterly gone. 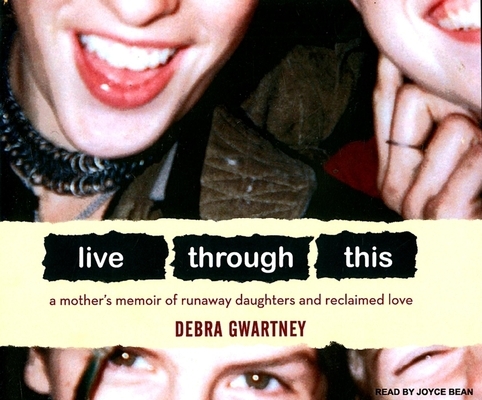 Live Through This-as emotionally wrenching and ultimately redemptive as David Sheff's Beautiful Boy-is the story of Gwartney's frantic effort to recover the beautiful, intelligent daughters she cherishes. The harrowing subculture of the American runaway, with its random violence, its horrendously dangerous street drugs, and its patchwork of hidden shelters-none of them interested in a parent's grief-is captured by Gwartney with brilliant intensity. Faced with the unraveling of the family she thought she could hold together through blind love, Gwartney begins the painful-and universal-journey toward recognizing her own flawed motivations as a mother. The triumph of Gwartney's story is its sensitive rendering of how all three, over several years, have dug deep for forgiveness and a return to profound love. Debra Gwartney, a former correspondent for "Newsweek" magazine, is currently on the nonfiction writing faculty at Portland State University. Joyce Bean is an accomplished audiobook narrator and director. In addition to being an "AudioFile" Earphones Award winner, she has been nominated multiple times for a prestigious Audie Award, including for "Good-bye and Amen" by Beth Gutcheon.